Lewis Hamilton was victorious in today's Russian Grand Prix at Sochi after the Mercedes team asked their drivers to switch positions. This clearly left Bottas disappointed after the race while third placed Vettel limited the damage in a weekend that saw Mercedes as the strongest team. On the starting grid, the top 4 started on ultra softs, with the next 6 drivers on hypersoft, decided by their use of tyres in Saturday's qualifying. Behind them were Renault's Sainz and Hulkenberg, both using new soft tyres, followed by the Williams and McLarens that started on ultra soft. In 18th and 19th were the Red Bulls on soft while Hartley at the back opted for hyper softs. As the lights went out, Bottas made the best getaway, but as cars came up to speed, those behind could enjoy his slipstream. This was particularly handy for Hamilton, who used it to great effect to fend off Vettel. The latter was much quicker off the line, but had to settle for third as Hamilton had the better line through Turn 2 and Turn 3. The best started was Max Verstappen who progressed from P18 to P11 in two laps. Daniel Ricciardo moved up to P16. Further ahead, Leclerc passed Magnussen round the outside of Turn 3. Just like Grosjean, Magnussen was found struggling, with the cars behind them challenging to take their positions. Toro Rosso endured a difficult start of the race. Gasly dropped back to last after spinning off in the first lap and then pitting on lap 4. Hartley had already pitted once by that time, and returned to the pits on lap 4 as well, immediately retiring both cars from the race. The team later confirmed that both cars retired due to brake issues. One lap later, Fernando Alonso made the first regular pitstop and changed to a new set of soft tyres. At the start of lap 8, Verstappen passed Leclerc for 5th, lapping 1.5s a lap faster than the Sauber. This left him with 13s of clear track ahead, enjoying a similar pace, or even slightly faster than the ultrasoft runners ahead of him. The other Red Bull, in the hands of Daniel Ricciardo, meanwhile entered the top 10 by passing Ericsson for 10th. The next laps saw most of the hypersoft runners pit. When Bottas pitted from the lead on lap 11, Perez did as well, the last of the hyper soft runners to do so. Bottas rejoined the race in 5th, 5.5s down on Verstappen, and 11s ahead of Ricciardo. Vettel pitted one lap later, followed by Hamilton the next lap. Kimi Raikkonen therefore took the lead as he opted to go a bit longer. The Finn pitted on lap 19. Interestingly, the pitstops allowed Vettel to sneak ahead of Hamilton, while at the same time, Vettel closed up behind Bottas rapidly thanks to the fastest lap of the race thus far. 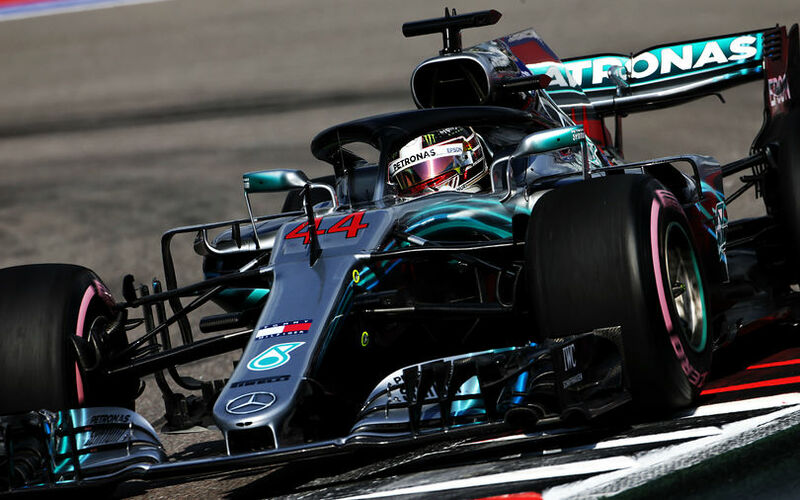 The initial surprise at Mercedes was quickly resolved though as Hamilton passed Vettel in Turn 4, after having had to back out of a passing attempt at Turn 2 due to Vettel closing the door. By lap 24, the Mercedes duo followed by Vettel had caught up with Verstappen. Two laps later, Bottas moved aside to let Hamilton take second place. Meanwhile at Force India, Perez got told to increase the pressure on Magnussen ahead of him. The team asked Ocon to let the Mexican past to have a go at the Haas driver, but Perez was told the positions would be switched back ahead of the race if he would fail to make it past Magnussen's Haas. And indeed, on lap 36, when Hulkenberg pitted from 7th and returned to the track 5s behind Ocon, positions were switched back, handing Ocon 9th again. On lap 39, just like Hulkenberg had done earlier, Ricciardo pits to change soft for ultrasoft tyres. Verstappen kept on going, but on lap 40 had to fend off an attack from Hamilton at Turn 2. Verstappen soon came on the radio to explain that his reduced pace was due to "a little bit cold tyres", but one lap later, he noted this were back to normal. Given this situation, it was only on lap 43 that Verstappen pitted, returning to the track with ultra soft tyres, 14s down on Raikkonen in 4th. The end of the race saw very few position changes, and only some antics towards the end when Hamilton had some trouble lapping Vandoorne and Sainz who were battling for 16th. One lap from the end, Bottas also asked his team what would happen, given that he had allowed Hamilton past earlier on, but the response was clear enough "positions will stay the same". Still, Toto Wolff and Valtteri Bottas were set to have a discussion, as the team principal noted on the radio "Valtteri, difficult day for you, difficult day for us. But let's discuss afterwards". That fixed the podium positions, with Hamilton winning yet again and extending his championship lead to Vettel even more.